SRINIGAR, Indian-administered Kashmir (CNN) -- The toll in the raging gunfights between the militants and Indian army in the Indian administered Kashmir rose to 19 Monday with the killing of four more Indian army troopers and five militants. 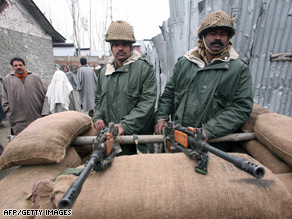 Indian soldiers stand guard in Srinagar. The ongoing fierce gun battles in the densely forested and foliaged mountain range of Shamswari, the deadliest in recent months, entered its fourth day Monday. "The thorough combing operation is in progress, and it is expected that a few more terrorists may be holed up in the area including an isolated house," Lt. Col. J.S. Brar, the spokesman of the Indian army in Srinagar said Monday evening. "Four more soldiers of the army and five militants died Monday in this raging encounter that has been going on in the densely forested Shamswari mountain range in north Kashmir Kupwara border district today," Brar told CNN. A major of the Indian army's 1-Para regiment and three troopers were killed before yesterday in the gunfights during which six militants had also been killed. Reports also said additional troops had been rushed in to augment the already heavy presence of the army in the area. "The operation which commenced on March 20 has been on for the last four days and has witnessed intermittent gunfights between the terrorists ensconced in the higher reaches of the dense forests and the soldiers," the spokesman said. In a separate incident one militant was killed in an encounter with police in south Kashmir's Shopian district Monday. Kashmir has been in the throes of a bloody secessionist campaign for nearly two decades in which, according to official figures, 43,000 people have been killed. Various rights groups and non-governmental organizations here, however, dispute the official statistics claiming that the number killed here during the last two decades is twice the official figure.